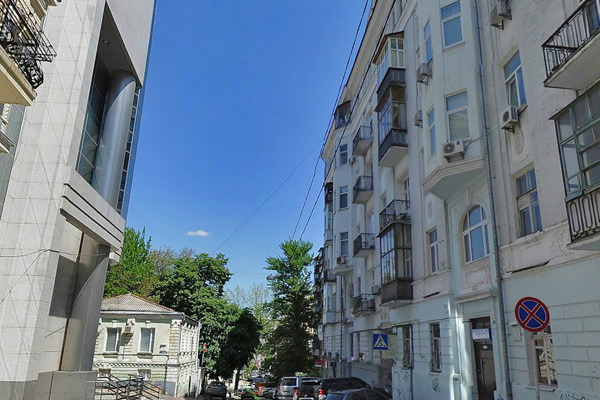 Home > One-room and studio apartments > 9A Mykhailivsky lane apt. This flat is situated at the very heart of Kiev amidst of the city's main landmarks: Maydan Nezalezhnosti (Independence Square), Sophiivska church and Mykhailivskyi monastery. 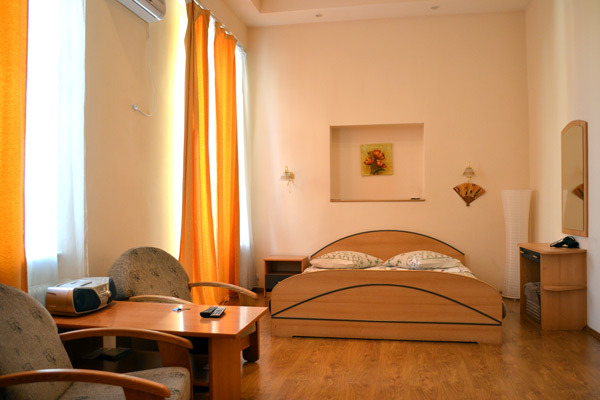 Great location with easy access to major Kiev's life and sightseeing places, especially valuable for foreign tourists. There are numerous restaurants on the neighboring streets, beer pubs and ukrainian native home-style eateries, popular due to their cheap and tasty meals. Also these blocks are flooded with nightclubs, museums and other entertainment places. Andriivskyi descent, the famous street of Kiev artists, painters, souvenirs and handicraft lays within just about 4-5 minutes strall. 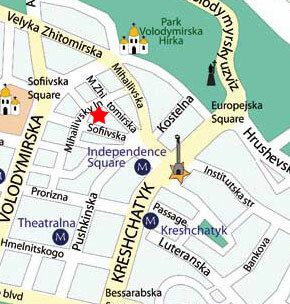 Nearest Metro stations are - "Maydan Nezalezhnosti" or "Zoloti Vorota", 2-3 minutes walking from the apartment. 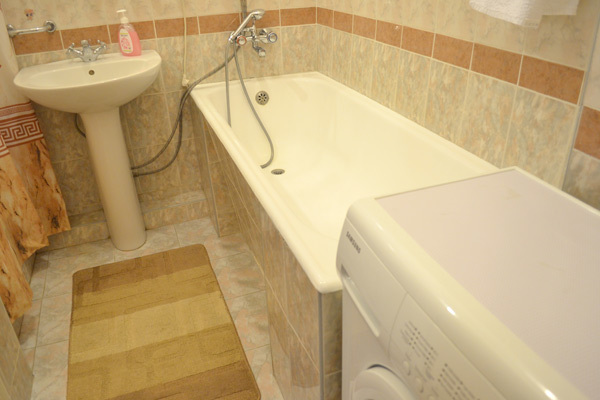 In general, this is the best location for all people searching for accommodation in Kiev, safe, interesting and comfortable. 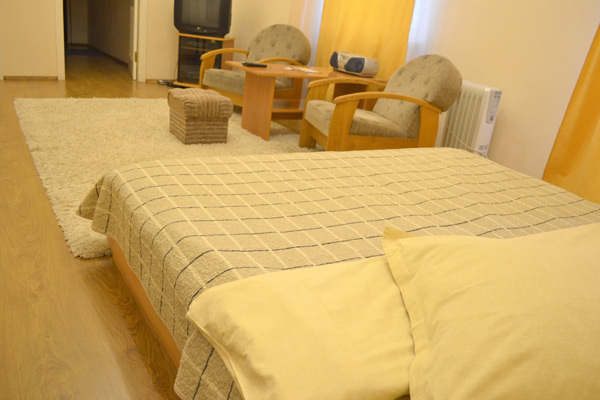 One-room apartment near Olimpiyskyi stadium and "Palace Sportu"
This apartment is located on the second floor of gorgeous historical building reised about 150 years ago during the tsar epoche. All such buildings have no more than 6 storeys, tall ceilings (approximately 4 meters height) and thick brick walls. Street entrance leads directly from the Mykhailivskyi lane. 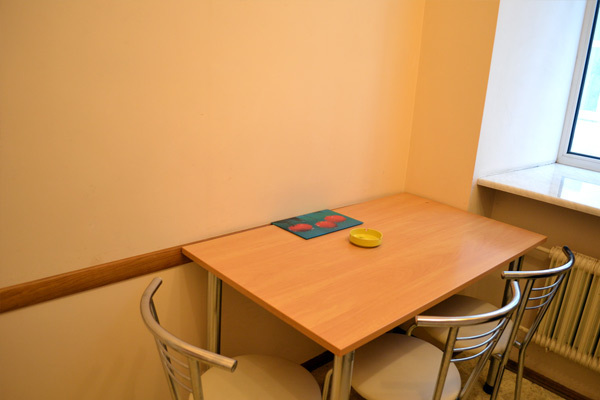 Apartment consists of one nicely decorated spacious room (42 square meters), a corridor, separated kitchen and bathroom. Also it comes with a small neat balcony for smokers. Huge arch windows allows a lot of light, floors are covered with nice wooden-style laminate. The room has king-size double bed installed, bureau, armchairs and wardrobe. Kitchen has everything necessary for everyday cooking, serving and storing meals and food, including fridge, microwave oven, gas stove, dining table with kitchen stools and all necessary eating utensils and crockery. Apartment has TV set with numerous cable channels also in English, German and Italian languages, high-speed internet connection with Wi-Fi access. Worth to mention that our office is located on the ground floor of the same building. And we have other apartments on the same staircase, so if it is necessary, the whole level can be rented.